For people with a love of gardens (and the numbers are rapidly growing), Dunedin is well placed to exceed their expectations. 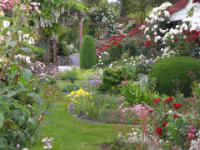 New Zealand is internationally recognised for its prestigious gardens. Three of the four of New Zealand’s Gardens of National Significance are located in Dunedin City. The New Zealand Garden Trust has been established by New Zealand’s national horticultural body, the Royal New Zealand Institute of Horticulture. Before a Garden can display the NZGT logo, it is inspected by a team of independent assessors who are looking for the creativity and attention to detail that makes these gardens stand out from others. 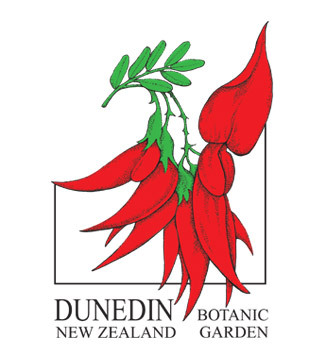 Established in 1863 and moved to its present site in 1867, the Dunedin Botanic Garden is New Zealand’s first Botanic Garden and is internationally recognised for its excellence as a public garden as well its botanical collections. Garden of National Significance. Set high on the hills of the Otago Peninsula is Larnach Castle and its splendid garden, reflecting over 40 years of dedication and hard work by its owners and staff. The Castle has also been acknowledged with the accolade Garden of International Significance. People don’t have to be a garden expert to enjoy themselves; it's about the atmosphere and the history, and being with nature. Begun in 1871 in a hidden valley, Glenfalloch Woodland Garden in Russell Bay on the Otago Peninsula offers rhododendrons, azaleas, magnolias and fushias set in a natural glen. Garden of National Significance. Dunedin’s newest garden is The Dunedin Chinese Garden which opened in late 2008 and immediately became the recipient of acclaim and awards. Built by The Dunedin Chinese Garden Trust, this is one of only three truly authentic gardens created outside China. Please do make time to visit these most splendid gardens. Dunedin City - New Zealand’s Most Beautiful City Award Winner (2008). Only a 30 minute walk from the centre of town, Dunedin Botanic Garden is an oasis in the city. The world renowned Rhododendron Dell and the New Zealand Native Plant collection are set amongst wild native forest. The aviary displays native parrots and you can hear wild native birds as you sit on a sunny lawn overlooking nearby rural hills. 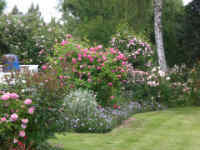 The flat lower botanic garden has formal displays of roses, herbaceous perennials and a rock garden, amongst others. The information centre, phone 477-4000, is open 363 days a year from 10am to 4pm and access to the botanic garden is free of charge and available from dawn till dusk. The winter garden glasshouse offers an all weather alternative and is close to the café. A brochure is available from the information centre, detailing the accessibility rating of every track in the botanic garden. Close to the heart of the city lies the Dunedin Botanic Garden, New Zealand's first (established 1863), a garden of great variety. From the almost level area of the Lower Garden to the bush surrounded slopes of the Upper Garden, full advantage is taken of the topography and the range of microclimates to grow a diverse range of plants. These features, along with the mild climate of Dunedin, make this an ideal site for a botanic garden. Dunedin Botanic Garden aims to be a botanically and horticulturally recognised resource providing educational opportunity and a pleasant place for recreational enjoyment. Centrally located in the Lower Garden is the restored Winter Garden. Opened in 1908, this Edwardian conservatory is used to cultivate plants which otherwise can not be grown in Dunedin. These include tropical and sub-tropical plants such as orchids, cycads and palms and from the arid regions - cacti and succulents. 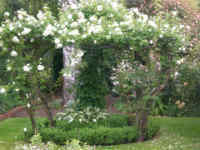 Also within the level area are to be found the Camellia, Herb, Water, Rose, Thematic plant, Herbaceous and Knot gardens. On the steep bank above the Lower Garden sprawls the massive Rock Garden containing alpine shrubs and trees, along with the more traditional diminutive rock and alpine herbs. The Upper Garden contains plants from North Asia, North, South and Central America, South Africa and the Himalayas as well as an extensive Australian plant collection surrounding the aviary complex. The New Zealand native plant section is grown in borders according to distinguished features, natural habitats or origin. They include New Zealand wetland and alpine plants and a naturalistic bush environment as well as rare and endangered native plant species. The Azalea Garden with mature magnolias and maples, provides an attractive entrance to the Rhododendron Dell which was initially planted in 1914. Today it is a magnificent woodland garden featuring over 3,500 specimens. The Garden is open from dawn to dusk every day and admission is free. It is a designated pedestrian area; animals are not permitted. An information centre, tea kiosk and playground, which are located in the Lower Gardens, are open daily from 10am-4pm. The Dunedin Chinese Garden commemorates the contribution Chinese people have made, and continue to make, to Dunedin’s history, culture and ongoing prosperity. The Dunedin Chinese Garden Trust lead the dream to create an authentic Chinese Garden in Dunedin, with support from the Shanghai Municipal Government and the Dunedin City Council. The design of the Garden evolved over a period of eight years to ensure authenticity and cultural accuracy, as well as practical functionality. The Garden construction and design was closely supervised and influenced by the architect from the Shanghai Construction and Decoration Company, and the Shanghai Museum. The Garden was pre-fabricated and assembled in Shanghai on a site identical in size and shape to that of Dunedin, then dismantled and transported to Dunedin where it was reconstructed on site using artisans and supervisors from Shanghai. The Dunedin Chinese Garden is the only authentic Chinese Garden in New Zealand. It is the first in the Southern Hemisphere and one of less than a handful outside China. The Dunedin Chinese Garden Trust handed the Garden to the Dunedin City Council on completion to manage and ensure its continued authenticity and integrity as a lasting footprint of Chinese identity and culture. There is always something to see in the gardens at Larnach Castle. The garden is Margaret Barker’s personal creation over 37 years and in 2004 was assessed as a Garden of National Significance by the New Zealand Gardens Trust www.gardens.org.nz (Royal New Zealand Institute of Horticulture www.rnzih.org.nz). The new plantings have been designed to complement the building and add a unique Southern Hemisphere feel to the grounds. Margaret Barker has a huge passion for Gondwana plants. Her vision for a South Seas garden stems from a long-term interest in New Zealand native plants and their relationships to their cousins in other southern countries. There is nothing like first hand research, knowledge and understanding gained by visiting these plants in their native habitats. Margaret has braved the roaring forties and furious fifties in a Russian polar explorer vessel to visit the Auckland and Campbell Islands and flown to the windswept Chatham Islands. She has also climbed Mt Gower in the pristine Lord Howe Islands, Cradle Mountain in Tasmania, The Andes in Chile and Argentina, where she camped amongst Monkey-Puzzle trees. Margaret’s interest in Southern Hemisphere plants has built up a great collection to be seen in the Castle grounds, with its variety of microclimates. 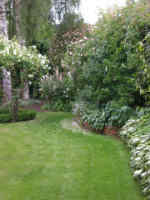 The garden has featured on many gardening programmes and magazines in NZ and overseas. Margaret has given a talk “My home, My Castle” and judged at the prestigious Ellerslie Flower Show in Auckland. She is also a trustee of the New Zealand Gardens Trustee. The garden has something to catch your interest year round. After the Spring flowers - a fiery display of Azaleas in front of the Ballroom. The Laburnum Arch flowers in late November – a golden tunnel to delight. The Rock Garden shows its tiny treasures to the world once again right through Summer and Autumn. In January, giant lilies (Cardiocrinums) and flame creeper turn the Rainforest Garden into a scented and visual delight. The Serpentine Herbaceous Walk with its rose strewn trelliswork is like a basket overflowing with colour. At this time the gardens are popular for weddings, with such a wonderful setting for photographs. Come Autumn and the Heather Garden blooms complementing the Autumn foliage and bringing a Scottish mood to the Castle. The Autumn Crocus (Colchicums) line the Great Arch and hide amongst the Azaleas. In Winter you can appreciate the layout of the garden and also find a few brave flowers putting on their best faces. Snowdrops signal Winter’s end and the cycle starts again. There is much to explore and enjoy for the whole family. Guests' needs are well serviced with a licensed café by the open fire in the Ballroom, toilet facilities and a gift shop. There is also country inn-style Lodge Accommodation in the Castle grounds for those who wish to stay in this splendid setting. And of course there is always the Castle itself to explore. The Barker family have spent 37 years restoring the Castle to award winning splendour. The panoramic views from the tower 1,090 feet above sea level are well worth seeing and also provide an overview of the layout of the garden and the unique collection of NZ antiques and stories (a bit of scandal and tragedy) share the Castle's history with visitors. Alice in Wonderland at Larnach Castle? “When we came here we found the figures of the Duchess and Knave” says Margaret Barker.“ I have always loved the story of Alice in Wonderland ever since I was a child and it was wonderful to discover these statues amidst the overgrown garden.” The Alice in Wonderland theme has been an amusing element to carry through in the garden. Visitors to the Castle may also search for the Cheshire Cat, an Oamaru stone carving which grins cheekily down from a fine vantage point. “It's pretty easy to find, but we have had overseas visitors, including memorably a girl from Cheshire in the UK, beg us to tell them where it is, frantically rushing around trying to find it before their coaches leave – and laughing as it is obvious where it should be". Another addition to this quirky subtext, and providing a wonderful focal in the rainforest, is the King of Hearts' throne. Bright pink of course and also visible from the Castle tower, looking wonderful set amongst the lush green background. “No sooner had the throne been installed in its commanding position than four little party princesses appeared, clambered on and had their photo taken by a doting dad. There are sure to be many romantic photos taken there, especially for our brides and grooms married at the Castle” . Margaret designed the throne herself, armed with her treasured Alice in Wonderland book with the original Tenniel drawings. The talented Stu Robbie, who has been responsible for executing many creative projects around the Castle, transformed the drawings into a seat fit for a king. A “Curious Door” has recently appeared in a tree trunk in the new South Seas garden. Margaret Barker explains. “After the Mad Hatter's tea party Alice discovers a door in a tree. We thought it would be fun to include this idea in our garden. The door is actually the original from the Tower that we discovered when we bought the Castle in 1967, it has wonderful character and really looks the part of the ‘curious door’ of Wonderland”. Unlike Alice’s door, this one does not open and lead into the long hall, but silently sits there, perhaps waiting for some magic words or a spell to lead the visitor into a different world. "There is a bit of an ‘in joke’ relating back to Mr Larnach. His biography is titled “King of the Castle” and we are sure he would thoroughly approve of this new addition to the grounds” explains Sophie Barker. Glenfalloch, Gaelic for 'hidden valley', is located on the Otago Peninsula, just 15 minutes from Dunedin city - there are panoramic views stretching all the way down the harbour to Taiaroa Head. The garden's 12 hectares, lying to the sun, are sheltered from the prevailing winds and rise 110 metres over its boundary length. There are many old oak, walnut, elm, horse chestnut, birch and English beech planted from 1872 giving an air of maturity. Glenfalloch was developed as a private garden from 1917 when many rhododendrons and azaleas were planted - these with Prunus and Magnolia are best seen in spring. In autumn the garden is a multitude of colours with maples contributing a splash of brilliance. Many flowering and fruiting native plants have been established to attract birds adding a further touch. A cafe and restaurant cater to the public while the old Glenfalloch homestead watches from above. Now owned by the Otago Peninsula Trust the garden is currently being restored. Guided tours are available at a cost of $6 per person. Prior arrangement required. Medium (0.5-5ha) size private garden with capacity for large (20+) group sizes. Recommended visit of 2 hours. Best to visit in Spring. Feel like scuffing your feet through the thick autumn leaves? Go on ... you know you want to. Come and visit Glenfalloch, the colours are stunning! Bannerman Park was named in 1977 in honour of Mr R B Bannerman, whose foresight helped procure extra land for the park. Known as the Hidden Valley, the land dates from the 1870's. 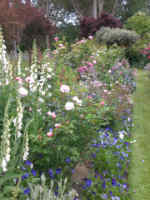 Since then herbaceous perennials have been extensively planted. Today, streams, bordered by sealed pathways, meander throughout the valley. The daffodils, meconopsis, camellias, cherry blossom and magnolias announce early spring. The rhododendron collection includes large beds of R. yunnanense, R. decorum and R. spinuliferum all grown from seed gathered in the wilds of the Yunnan Province in China. In November the streams and ponds are lush with gunneras, hostas, irises and candelabra primulas. Native ferns, astelias and Chatham Island forget-me-nots also edge the streams. Peonies, daylilies and ajuga groundcover add to the colour as summer progresses. The deciduous foliage provides brilliant autumn colour from the weeping maples to the oaks, twisty willows and silver birches shading the picnic tables. Then winter brings the hellebores into flower. Most of the plants in the park are named. Stout walking shoes recommended. Dolamore Park is named in honour of the Dolamore family whose gift allowed the camping area to be developed. The Gore Borough Council originally bought the land in 1940 to establish a public picnic area and provide access into the adjacent Croydon Bush Scenic Reserve in order to maintain it as a wildlife sanctuary. Walking tracks enable visitors to view the native birdlife, such as wood pigeons, fantails, bellbirds and tui especially in spring when the kowhai and flax flower. This native forested area forms a green backdrop for the park and is the largest lowland broadleaf Podocarp forest in the region, featuring substantial stands of southern rata and rimu, totara and matai over 500 years old. The Waimumu Stream and Whisky Creek running through the park are home to trout, eels, crayfish, ducks, geese and native shags, herons and kingfishers. Extensive lawns are bordered by stonewall terracing. In spring the mature rhododendrons feature, followed by the red rata flowers in summer. Fine selections of conifers can be seen in the Bert Newman Arboretum and the Ian Gilchrist Conifer Collection. The park includes a children's playground and is popular for picnics, parties, barbecues and camping. A country music festival is held here each February. An Education Centre is open by appointment, displaying interactive information, which shows the balance of biodiversity in native forests. Stout walking shoes recommended. The land was originally set aside in 1874, but not laid out until 1906 by David Tannock of Dunedin. The present design is based on this historic layout and incorporates many mature trees such as the gigantic Wellingtonia and horizontal elms planted at that time. Among the exotic trees and shrubs are a number of rare and unusual specimens including those in the extensive conifer border. Spring bulbs are accompanied by the camellias, magnolia and enkianthus trees flowering. 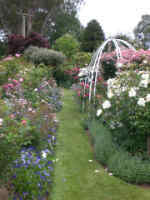 Then Gore's Rhododendron Festival is held each year in the Gardens in October, complemented by the spring bedding display of annuals. Tree peonies are a feature, the peony border being spectacular in November. This is followed by the roses, modern varieties making an impressive display through the summer months when the eucryphia trees blossom. Further annuals continue into the autumn as the deciduous foliage begins to turn on the maple trees, and enkianthus becomes a bright red and red berries appear on the sorbus trees. Winter features include the witch hazels, which bear yellow flowers on bare branches after the yellow autumn foliage drops. Hawthorns (Crataegus) produce red berries through the winter after the white blossom finishes. The conifer border is also a winter attraction and the Winter Garden complex is open all year. An added feature is the aviary, especially in spring. Stout walking shoes recommended.